iFinance 4 allows you to keep track of your income and expenses in the most convenient and fastest way. By taking a quick look at its useful evaluations and charts, you'll immediately know what you spend money on and where your income comes from - optimizing your finances becomes a breeze! iFinance's automatic category assignment, keywords, budgets and analysis features will turn your bank account history into much more than a list of bare figures. Would you like to find out how your assets perform or why you max out your bank account on a regular basis without really knowing where your salary goes each month? iFinance 4 has all the answers. Is it current spending such as rent or mortgage payments, insurances, food or loans? Or do nights out with friends, special treats, impulse purchases, and tobacco products add up to a hefty sum? Have iFinance 4 analyze your finances and see immediately what your biggest spending items are and where there is potential for savings. Import your transactions as a CSV-, QIF-, OFX- or mt940 file in order to see all transactions in iFinance. iFinance is also able to print on money transfer forms. Customers of a German bank are able to use HBCI import and HBCI banking. 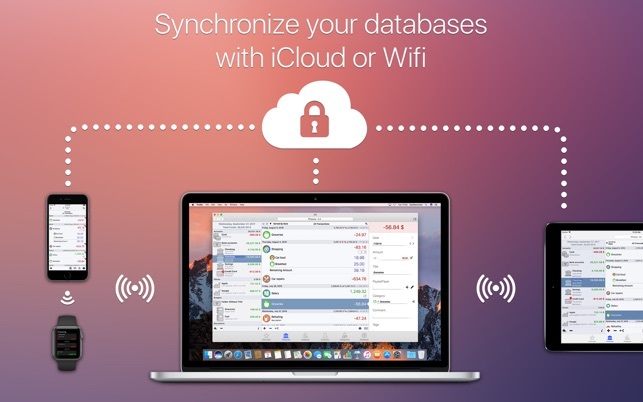 Synchronize your data between Mac computers, iPhones, and iPads (iFinance 4 for iOS sold separately at the iOS App Store) via iCloud or the integrated WiFi sync. 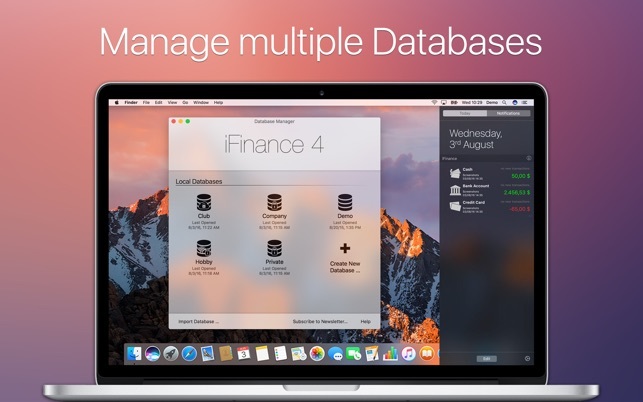 The latter also allows you to use and edit databases together with multiple users. This may for example become useful if you are in charge of a club's or association's finances or if you manage a bank account with another person. 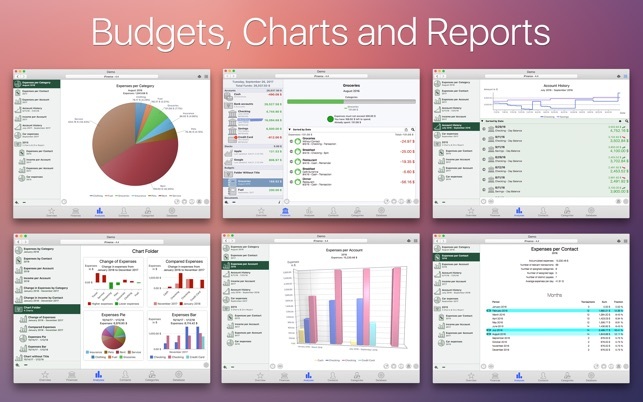 iFinance 4 offers a broad range of easy-to-customize charts and reports. According to your specifications, iFinance analyzes precisely where your money comes from and where you spend it. Use the Budgets feature to find out how much money you have left for the current month or whether you've been successful at keeping your spending at bay this month. Budgets can also be created for specific categories, such as monthly budgets for clothing, groceries or movie nights. 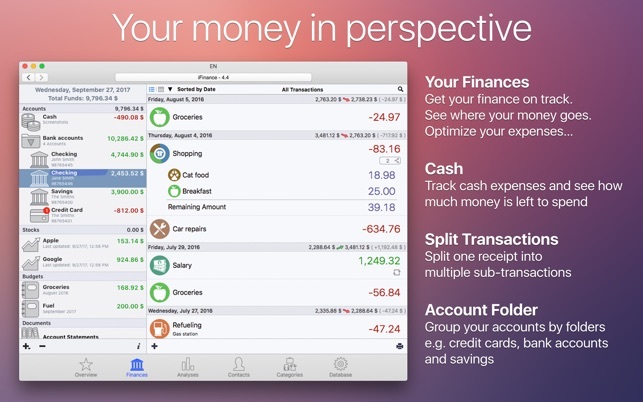 iFinance Mobile is available for iPad, iPhone, and Apple Watch and can be purchased separately. The mobile version offers the complete range of iFinance features and is available from the iOS App Store. I wanted to like this, I really did. I spend more time chasing down errors than I do minding my finances. It isn’t compatible with my Credit Union and the manual balances don’t match up for more than a few weeks to a month. I expect a lot from Synium. Hope it turns out that way. I hate to leave a negative review, I appreciate the work that goes into building a program but I am just not thrilled with this one which was by no means inexpensive. Why do I have to click so many buttons to perform the most simple tasks? 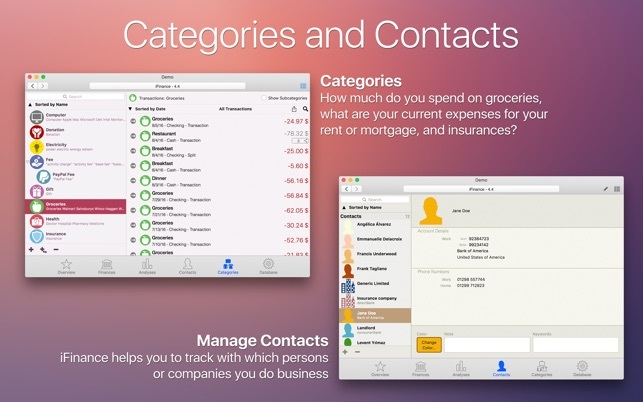 Categories and reconciling for example take so many click click clicks! Repetitive actions should be simple to tab through without going back and forth from mouse to keyboard repeatedly. Categories should not need to be “programmed in” with each new vendor, should simply tab to categories and scroll/click for locations without going to mouse and programming each one. Reconciling items should require one easy action, not three or more, not three buttons simultaneously either, just one tap please. Perhaps not worth mentioning as it is a subjective aspect, I just don’t like the interface. I think in an attempt to make it “look simple” it looks almost elementary consequently it adds so many spaces, colors and lines that it’s cumbersome to quickly view. Laslty, I spent the extra $ for app to sync on phone and it is just not reliable. If I use it on one device, when go back to other it asks me which version I want to keep and delete, I cannot be confident I will not lose data. I would like this program more if it streamlined it’s appearance and daily use and made the cloud more reliable. Honestly if had been less expensive I would ditch it.